Paths for gardens lead from one area of the garden towards a destination, often another section of the garden containing a particular sculpture, specimen or other focal point. Garden paths and walkways also give the garden landscape some structure along with delineation. 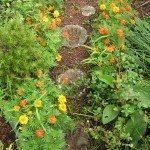 Garden paths may create a pattern in the garden; allow for ease of harvest, pruning and weeding and protect grass or tender plants from being trampled upon. When designing a garden path, the choice of materials varies depending upon not only the budget, but the feel or theme of the garden. For instance, is the garden formal or informal? Is there a water feature or other point that can be joined by the inclusion of a bridge? Of course, what is the working budget for landscape design and how much is allotted for garden paths and walkways? Garden path ideas can run the gamut from pricey to do-it-yourself recycled projects. Many suburban gardens are comprised of a lawn surrounded by landscape beds of vegetation, while although nice, can be a bit boring. Designing a garden path, or several paths, reduces the size of the lawn, thereby reducing the amount of irrigation needed and creating some drama that enlivens the garden structure. When considering garden path ideas and placement, it’s helpful to sketch out a plan on paper that can be reworked and tweaked before investing in materials or randomly digging up sod. The placement of paths for the garden can then be laid out with twine, rope or even a garden hose to better access the correct placement. Consider which areas of the garden will benefit most from the construction of pathways. Entryways will always benefit from a path, framing the front door and inviting the visitor inside the home. An entryway should complement the size of the house and is usually a wide path of 5 feet or more across. An arced or even zigzag pattern tends to be more interesting than a straight shot to the front door, but even that can be made interesting with the choice of material and addition of landscape plants and details, such as lighting. Paths for gardens should be wide enough for two people to stroll along together, or at least as wide as a wheelbarrow or other needed garden equipment to fit through — at least 4 feet wide. The width should also take into consideration the entire feel of the garden, materials for use and whether an inclusion of a nook, bench or other planned garden décor might dictate even wider proportions. You may even want a more central, wider path with branches of narrower discrete paths veering off from it. You will also want to consider whether any steps will be needed to bridge height differences in the garden. Cost is not the only factor to consider when planning garden pathways. The purpose of your pathway may dictate its construction. Is the path being built for strolling and admiring the garden, or is it utilitarian, making it easier to access areas for maintenance or harvest? Permeable surfaces such as gravel or decomposed granite to promote drainage may be considered. You may choose a path composed of moss, grass, creeping thyme or other plants that are resistant to the damage of foot traffic. Also, consider whether a brick, flagstone or what-have-you will become dangerously icy or slick. Color of the material may play a role, depending upon your climate. Lighter colors reflect light and tend to stay cool under foot, although they may add to sun glare, while dark colors absorb the warmth of the sun. 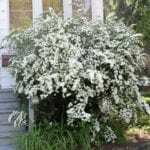 The material may be chosen because of its ability to retard weeds. Black plastic or landscape fabric can be laid out after your path has been laid out and prior to construction to discourage weed growth. Weeds can be controlled either through tedious hand weeding or herbicides, but the best defense is the choice of material used and/or a lassez faire attitude of general indifference to the appearance of the occasional weed. 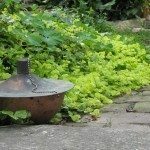 Bark, ground covers, river rock, sand, gravel, brick, flagstone or even broken up concrete from the destruction of an old patio can all be used for creating interesting pathways. The noise level created should also be considered, such as gravel, which crunches and is sometimes annoying. A curve in the path or an arrangement of a few steps with a plateau from which to view the garden, along with the placement of boulders, statuary and other ornamental objects, water features, gates, seating options and plant specimens all add to the aesthetics of the garden. Container plants, aromatic plants and those with different sizes, colors and textures complete the vision of the pathway.